Also make sure to book mark this page and come back often, follow the RSS feed, or even just call me and I will email you the updates on companies like Loads R Us LLC or other brokers that aren’t paying carriers. Are you trying to find ACS Logistics to get paid? Call today to see what is possible. 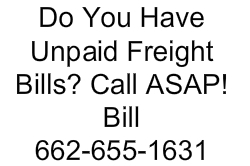 There are/were a freight broker in the Houston area that brokered freight from shippers to trucking companies. Are you trying to get paid by SAI Logistics too? Are you a trucking company or a transportation factor trying to hunt them down? So if you want to get paid by this company, call today!